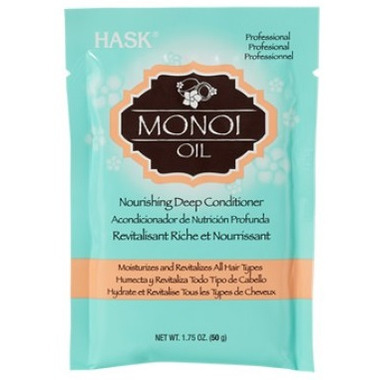 Hit the snooze button and give your hair a tropical vacation with Hask® Monoi Oil Nourishing Deep Conditioner. This ultra-restorative treatment will revitalize all hair types. Monoi Oil, native to Tahiti, is known for its re-hydrating and softening qualities and for leaving your hair nourished, moisturized and revived. Ideal for all hair types, this deep conditioner’s delicious coconut scent will awaken your senses. Treat your hair with this intense conditioner, formulated to bring life back into your luscious-looking locks! Directions: Apply a generous amount of Monoi Oil Nourishing Deep Conditioner to clean, wet hair. Massage into hair, focusing on damaged areas. Let penetrate for 10 minutes. Rinse well. Style as usual. Ideal for use 1-2 times per week. For the most vibrant results, finish with Hask® Monoi Oil Nourishing Shine Oil. Cruelty Free: This product is not tested on animals!